Join the Varmints! podcast for this rerun of our episode about those wiggly-tailed barnyard superstars, pigs! You can swim with pigs in the Bahamas! Click here to read the article, courtesy of cnbc.com! Truffles: Why Pigs Can Sniff Them Out, read all about it here courtesy of nytimes.com. There’s a boy pig under there! Help him, human! Filthy as a pig? We don’t think so! Read about it here courtesy of howstuffworks.com. We like a good wallow, but not in our poo! Babe, the New Sheepdog! Video courtesy of YouTube user Movieclips. Don’t embarrass the lineage of Great Bahoo. 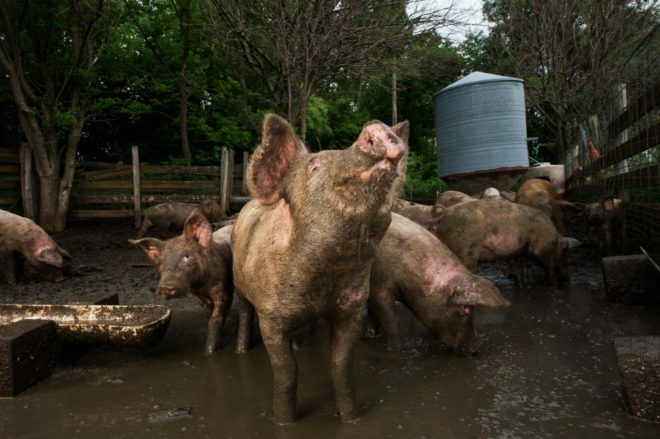 Harnessing the Power of Poo: Pig Waste Becomes Electricity, read about it here courtesy of nationalgeographic.com. Now you know a bit about pigs! What’s your opinion on them? We want to hear from you! Send us your suggestions for animals you’d like to hear us talk about, or just drop us a line about anything at varmintspodcast@gmail.com! We might even read your fascinating email on the show. Blazing Caribou Studios Donna Hume Paul Csomo Pigs Varmints!